At the urgent request of an old school friend, Drew and Madeline Farthering come to Bloodworth Park Lodge in the midst of the Yorkshire moors, a place as moody and mysterious as a Bronte hero. There have been several worrisome incidents around those lonesome rolling hills — property desecrated, fires started, sheep and cattle scattered. Worst of all, the vicar has been found dead on the steps of the church, a crime for which Drew can discern no motive at all. Few in the town of Bunting’s Nest seem like suspects, and Drew can’t keep his suspicions from falling on his friend’s new bride. Do her affections lie more with her husband’s money and estate, while her romantic interests stray to their fiery Welsh gamekeeper? As the danger grows even closer, it’s up to Drew to look past his own prejudices, determine what’s really going on, and find the killer before it’s too late. 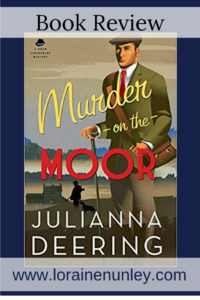 My favorite amateur sleuth is back solving a mystery in a setting that is as mysterious as the murder occurring in it. This mystery was filled with twists and turns, eliminating and then adding suspects until I wasn’t sure Drew would be able to solve it. I needn’t have worried. As I have come to hope and expect, Drew was able to put the pieces of the puzzle together just in the nick of time. This story was a little slow to begin with, but there was quite a bit of set up, introducing the town and the scary moors. What a great place for a mystery though. The creepiness carried from the moor and through the story until the murderer was caught. Drew and Madeline had been married for a little bit at this point and I really enjoyed how their relationship as man and wife had developed. Also, Nick was back and after the way things ended for him in the previous book, I was so glad to see him return not too worse for the wear. 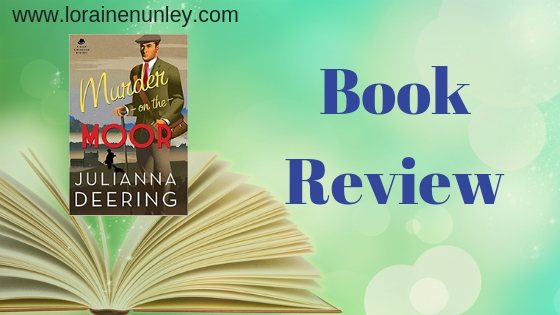 If you’ve read any of my other reviews on the Drew Farthering mystery series, then you will know my answer to that is the handsome sleuth himself. I loved that he is flawed in his perceptions. Don’t we all suffer from prejudice at some time or another? The pace at the beginning was a little slow for me on this story, but it did pick up and have a good mystery to solve. Would I recommend this book to others? Yes. It’s a good mystery with a creepy setting, and wonderful characters. This is the fifth book of the series and it can be read as a standalone. I’ve enjoyed watching Drew and Madeline grow closer, so I recommend reading the series.